MyEDiary groups provide an easy way to communicate with people that meet regularly or have something in common, such as a club or a sporting team. Announcements, events, and homework tasks can be created and assigned to groups. Groups are created and managed independently of classes, so they are not effected by any changes to classes or timetables. 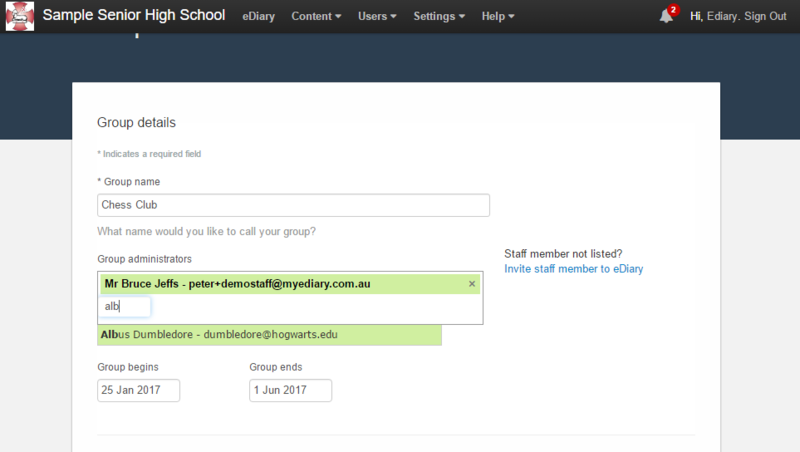 Groups functionality is available for eDiary Administrators and normal staff level access. Click the Groups icon from your MyEDiary dashboard. Click the 'New Group' button at the top right of screen. Enter the name for your group, choose the staff who will be responsible for administering this Group, and choose the start and end dates for the group. Staff members will only be able to communicate with or edit groups for which they are a group administrator. eDiary Administrators can communicate with and edit all groups. Choose the group type then enter the members of the group. Groups can only contain staff or students or parents, not a mixture of these types. Even though groups can only contain one type of user, communication can still reach other user types if desired. For example, an announcement sent to a student type group will also reach the parents of students in that group if parents are selected when sending the announcement. Click on the 'Save' button to create your group! Groups can be edited or deleted by clicking the edit menu beside the group. Click on the name of the group to view more information or to communicate with the members of the group. This can be done from the Create new menu. Once a group is created it is also available to be chosen from any area in MyEDiary where classes would normally be chosen to communicate with. This includes Announcements, Events, Homework and Auto Tasks. eDiary administrators have access to all groups, whereas staff members only have access to the groups they administer. Homework and Auto Tasks can only be created for student type groups.